This evening at about 7 pm the clouds finally started to break up a bit after almost five straight days without sun. The barometer has been holding quite steady since the 10th at around 990 millibars, and the wind is just a whisper at about 3 knots. The upshot of all this meteorological tranquility is a calm sea. There is a moderate ground swell from the north, but the sea surface is almost glassy. And as we just discovered, these are great conditions for penguin watching. During the last hour or so we've seen about 15 "pods" of King penguins (Aptenodytes patagonicus), each containing 3-7 birds. Kings are the second largest penguins after their cousins the Emperors (A. forsteri), stretching about 3 feet from head to tail and weighing between 30 and 40 lbs. They are readily identified in these seas by their bright yellow collar and large size. 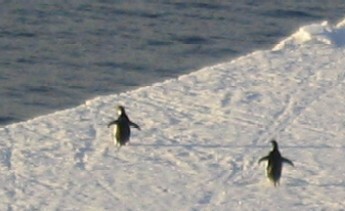 The penguins are first visible as a group of indistinct low profiles floating atop the surface. As we move closer the black heads and white necks come into focus, making them resemble a loon or grebe. But as the Palmer approaches even nearer, the avian character of these birds quickly disappears. They swiftly slip beneath the surface, then retreat from the ship in an explosive series of jumps that takes them several feet above the water surface. This "porpoising" is characteristic of the penguin family, and provides their initial resemblance to miniature dolphins. The resemblance is further strengthened by the penguins' coloration—the classic counter-shaded profile of so many marine animals. Their dark backs and light bellies are clearly visible with each leap across the air-water interface. The icing on the cake, though, is where these "birds" are hanging out—150 miles from the nearest piece of land, tiny Macquarie Island. All penguins are completely flightless, so that means these birds have swum at least 150 miles to their present location. For someone who has always associated these creatures with the ice edge, this realization is a wee bit astonishing. The next question is why all these penguins chose to swim to this particular patch of ocean. It might be that they've been present all along, and it's only now that we can see them due to the calm seas. A dark bird with a white chest is, after all, very well camouflaged amidst the dark water and white caps of the normally choppy Southern Ocean. There are at least two possible oceanographic explanations as well. First, we recently crossed the Antarctic Convergence or Polar Front, where cold Antarctic surface waters meet the more temperate waters of the southeastern Pacific. We crossed this boundary a few days ago and smiled as the water warmed from ~0 to 5° C (32 to 41F). The steep gradient in seawater temperature and salinity in this area helps power the Antarctic Circumpolar Current (also known as the West Wind Drift), which transports more water than any other current system in the world ocean. Could the Polar Front or Circumpolar Current be concentrating the squid and fish that serve as the King penguins' favorite food? We've also noticed that we're currently sailing almost directly above the steep edge of the Campbell Plateau, a shallow extension of the New Zealand landmass that rises almost two miles above the deep-ocean floor to its south. Could upwelling from this submarine escarpment perhaps help explain the concentration of food that must surely be drawing the penguins to this otherwise unremarkable spot? We typically think of penguins as comical little men wearing tuxedoes and waddling about on the ice. Tonight we realized that penguins on land or ice are out of their true element. Only when you see them in the water can you truly appreciate the elegance and power of these incredible seabirds.